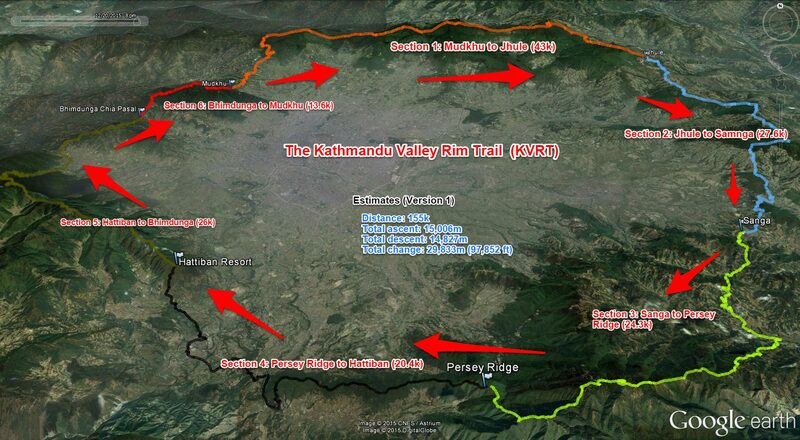 Update: This post was originally part trip report from an OKT attempt in late November, 2015 and part guide for the Kathmandu Valley Rim Trail. In May, 2017, I moved most of the ‘guide’ content over to Himalayan Adventure Labs and left most of the trip report and personal details on this page. First off, I’m going to go out on a limb and say it is what is detailed here and on Himalayan Adventure Labs. Maybe we can call this version 0.1 There is no official trail that circles the whole city. When I asked local people who I knew were interested in the topic, everyone seemed to have a different opinion of what ridges and peaks should be included in a circumnavigation. I needed a starting point. I bought a ‘Biking the Kathmandu Valley’ map from Himalaya Map House – my favorite cartographers. Unfortunately the scale was too big and there were too many options. My friend Stephen Keeling, a long time resident of the valley, had mountain biked his version of the valley rim several times and also attempted a run once. He lent me some GPS tracks and I used these as the basis for several scouting trips, sometimes hiking, sometimes running. If anyone is the architect of the valley rim trail, it is Stephen as he gave me the blueprints I needed. I am also indebted to Richard Bull of www.trailrunningnepal.org who has organized many runs around Kathmandu and routinely posts GPS tracks. Over October and November 2015, I explored these trails trying to familiarize myself with the geography and searching for alternate routes.. Two of these scouting trips were with Naomi Press, we had an amazing time hiking and camping high above the city. Back in 2010 and 2011, I used to make my students visiting from the University of Washington climb all 5 floors to the rooftop of the Hotel Marshyandi. We would toil up the marble stairs, footsteps echoing up and down until we at last reached the top. Only in Kathmandu there is almost never one rooftop, so we would find the narrow ladder and climb to the very top where vertigo would momentarily sieze me and threaten to pitch me off the edge. I wanted them to see the distant mountains that circled the city, the gnarled ridges and gentle saddles. On the rooftop, the wind and the views would leave the students momentarily at loss for words as they realized that Kathmandu was much more than the narrow alleyways of Thamel, the street louts, souvenir shops and the glimpses of heart wrenching poverty. But we never ventured into those nearby hills and mountain ridges; like most visitors we were compelled to travel to far-off places, believing the only way to get close to the Himalaya was to distance ourselves from the city. It took several more years, and several more trips to Nepal, before I finally started exploring the Kathmandu Valley Rim. I was at a loss for a starting point, finally finding that in the main entrance to Shiva Puri National Park to the north. Up I would go and quickly admire how fast I could get above the city, the chaos swiftly receeding until it was just me, troops of monkeys and the occasional wood gatherer. I rarely saw anyone else and couldn’t understand how the seething city below didn’t send more refugees up onto the trails. Over time I learned secret entrances into the park and rarely used trails that I could run down, feet kicking up leaves and spirits soaring. In 2013 I helped mark trails and did basic logistics for the first Kathmandu Ultra organized by www.trailrunningnepal.org But my explorations were mostly focused on this northern part of the city. It was close to home and the other parts of the rim seemed too far away; the approach trails a mystery to me. Over the past two years, as I’ve explored other long runs in Nepal and the world, the idea of running around the valley rim in a continuous push has slowly formed. I knew that doing something like this would compel me to ‘finally get out there’ and explore the other parts of the rim and I’m happy to report I finally accomplished this goal. In late November, 2015, after a lot of planning and scouting, I finally had a complete set of GPS tracks that I felt did a good job of following ridges and hitting prominent peaks, while also avoiding roads. It measured in at close to 160 kilometers, the most I was interested in trying to cover in a continuous push, especially given over twelve thousand meters of elevation gain. Nothing to sneeze at. It’s easy to set an OKT when you design the route! But my real goal was to enjoy the valley rim, try it in one push, and hopefully inspire others to get up there and better my time or just have a good time themselves! On November 26th, I started from Mudkhu, a small road intersection that was reasonably close to my house. Over the course of the next 50 hours, I ran and walked in a clockwise fashion around the valley and had an amazing time. I saw the sun rise twice, chatted with monkeys, climbed a million stairs, worried about wild boars and leopards (not really that much of a threat but your mind does funny things) and had my spirits bolstered by friends who joined me along the way. And in the end, everything worked and I finished strong with a smile on my face five minutes under 50 hours. Now this wasn’t my first rodeo and I have a lot of fast friends in the endurance running world. Fifty hours is not a fast time for 160 kilometers, even if you factor in the elevation gain. But my goal was not to do it fast, my goal was just to finish, be safe, and have a smile on my face at the end. I would love to see others tackle this and beat this time. I would also love to see others simply use my notes and go for an awesome hike in these overlooked mountains. Trust me, you don’t need to fly to Lukla or bus to Pokhara to see the Himalaya tower over you – that front row seat is closer than you think. I had a lot of help along the way and feedback from others who are interested in hiking and running on the rim. After my run, Hannan Lewsley wrote a nice article in the Nepali Times: “Just running around: Two days, 172km and one American university professor” And it was also nice of Richard Bull at Trail Running Nepal to do a little write-up. Big thanks to Stephen Keeling for providing the initial GPS tracks that I used during my scouting trips, and also for joining me for a section of the run and for bringing his friend Sergi. I owe thanks to Posan, Sudeep Kandel, and Richard Bull for additional GPS tracks. Mara Larsen, Maneesh, and Mark Brightwell (great trip report on Manaslu by Mark!) joined me at Hattiban Resort and Mark stuck with me for over 12 hours until the very end. Thanks also to Dorjee Sherpa from Himalaya Windhorse Adventures for serving as an emergency backstop, Pawan from Himalaya Map House, Michelle Landry for exploring Nagarjan with me, and Naomi Press for scouting over a third of the trail with me. Note – distance and vertical gain estimates on this map were early and should not be relied on! See HAL site and gps files there for updated estimates! Below is an interactive map with my satellite transponder tracks from my attempt at running the KVRT. If you choose to open it in a new window (also done by clicking on the wikiloc logo in the upper right) you can change the underlying map layers (OpenCycle includes contour lines) Because the track was recorded at arbitrary 10 minute increments – it grossly underestimates the distance and elevation change, but it provides a quick and easy overview. If you would like to see the points hosted on Delorme’s website you can find them here by filtering the date range to the last two days of November, 2015. And the maps and gps files found on the different pages for each segment will include more detailed GPS tracks. Crazy stonework – so many stairs! It’s so nice to have company for a while! After they pick up their bikes I follow them for a while along a irrigation canal. Fun. 37 hours: Mark, Manesh, and Mara are waiting for me at Hattiban Resort. We eat dhal bhat and then head out into the night at 7:30pm. About 47 hours in – taking a 10 minute ‘magic nap’ on the trail. Still quite cold so we layer up before laying down. Elevation profile based on 10 minute increments – so a big underestimate but still big numbers! I used an ultraspire fastpack to carry my stuff. For warmth I brought a puffy jacket (Feathered Friends) and puffy pants (Montbell) mostly out of worry of falling in the middle of the night, becoming immobile, and having no real insulation. It gets cold up on the ridges at night! I never wore these. I brought two smartphones, both with all GPS stuff loaded and plenty of phone credit. I also brought a battery pack with 20,000 milliamp hours, Delorme Sat Transponder. Other critical pieces of gear: Petzl Nao Headlamp, Fenix handheld 160 lumen flashlight, Black Diamond Carbon Fiber trekking poles, OR Helium II shell, Mountain Hardwear wind shell, Brooks Cascadia shoes which were almost totally blown out. I threw them away after the run.